Size: * 5 lb. 15 lb. Make sure your puppy gets off to a healthy start with a natural puppy food designed for growth and development. 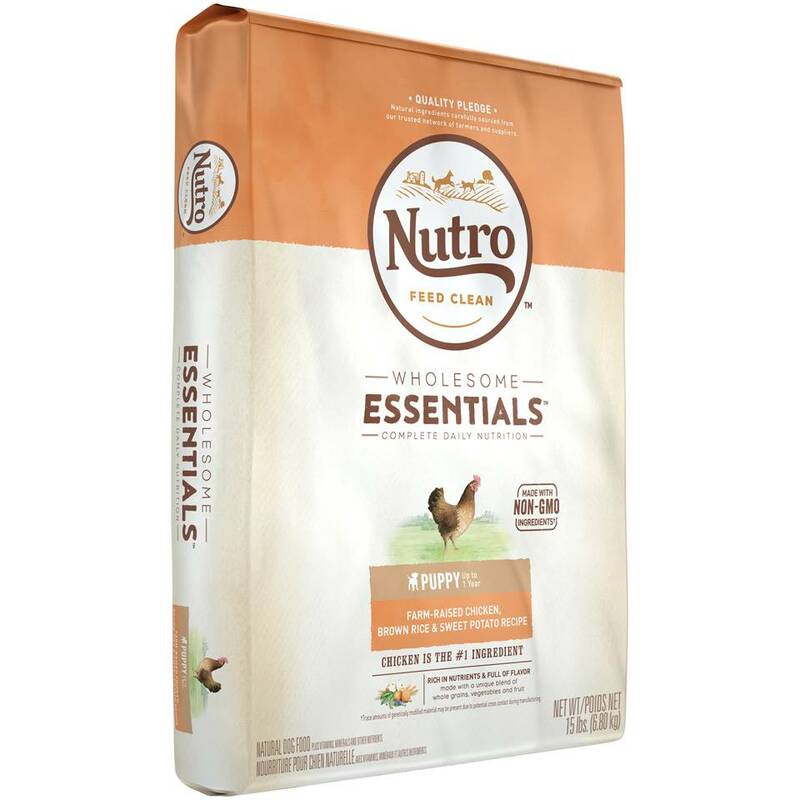 NUTRO™ Original Puppy Food contains real, farm-raised chicken with amino acids necessary for building muscle and maintaining a healthy metabolism. We've also added oatmeal for sensitive stomachs, whole brown rice for better nutrient absorption and a precise balance of calcium and phosphorus to help build strong bones and teeth. Our premium puppy food provides the long-term benefits you want and real results you can actually see. Chicken, Chicken Meal, Brewers Rice, Rice Bran, Split Peas, Pea Protein, Chicken Fat (preserved with mixed Tocopherols), Whole Brown Rice, Whole Grain Oatmeal, Natural Flavor, Dried Plain Beet Pulp, Sunflower Oil (preserved with mixed Tocopherols), Soybean Oil (preserved with mixed Tocopherols), Fish Oil (preserved with mixed Tocopherols), Potassium Chloride, Salt, Choline Chloride, Zinc Sulfate, Niacin Supplement, Vitamin E Supplement, Calcium Pantothenate, Riboflavin Supplement (Vitamin B2), Pyridoxine Hydrochloride (Vitamin B6), Vitamin B12 Supplement, Iron Amino Acid Chelate, Copper Amino Acid Chelate, Selenium Yeast, Biotin, Manganese Amino Acid Chelate, Vitamin A Supplement, Thiamine Mononitrate (Vitamin B1), Vitamin D3 Supplement, Potassium Iodide, Folic Acid, Rosemary Extract, Decaffeinated Green Tea Extract, Spearmint Extract.